We believe that our customers deserve nothing short of best. To cater the varied communication needs of our clients and deliver superior solutions and services in Softphone. IAX softphone , which is the basic model , IAX Softphone especially designed to give you a soothing communication experience for Asterisk for VoIP signalling. 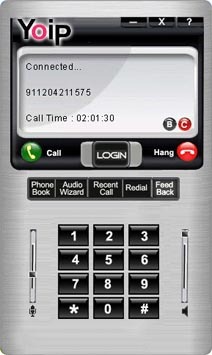 IAX softphone is extremely flexible and is crafted out while keeping the various requirements of our clients,however it is mainly designed for control of IP voice calls.It strategically add the power of live voice communication to any PC-to-Phone , PC-to-PC and and to provide native support for NAT (Network Address Translation) transparency. IAX softphone is easy to use behind firewalls.Furthermore IAX Softphone can be used in countries where ISPs are filtering the VoIP, IAX can be easily hidden.This Softphone comes with the following set of features. Softphone IAX (Downloadable)with one Brand Name/Logo and one Skin.